The title-page of Les oeu[v]res de Lespine... Turin 1627. Lespine travelled through Artois, via Brussels in the Spanish Low Countries and to the Netherlands, where among others he met the governor Maurice of Nassau (1567–1625). During his stay in Holland he may also have met his compatriot and fellow lute composer Nicolaes Vallet. It does not seem to be a mere coincidence that, in Vallet’s Het tweede Boeck Van de Luyt-Tablatuer… (Amsterdam 1616) there is a Fantasye de Maistre lespine to which Vallet added a Fantasye Responce a la prescedente. However, so far no other connections between the two lute players have been verified. Passing through Zealand and Friesland Lespine left the continent at Middelbourg or Flessingue6) probably in 1610, arriving in England at Yarmouth. He was well received at Hampton Court by Des Hays (Lord Hay? ), was granted an audience with Queen Anne and received several marks of favour. Queen Anne was well known for her great expenditure on music, masques and entertainment but also for bringing the finest writers, designers and musicians to her court.7) Lespine reciprocated the Queen’s favours with complimentary poems and music. In two of the Swedish manuscripts containing his music there is a Courante de la reine Angleterre,8) which may have been composed by him. After hearing him play the lute the Queen said, according to Lespine himself: ”You are welcome to my kingdom and you will not regret that you have come to see me”. She furthermore showed her benevolence by letting the Countess Montgomery (l’une de plus vertueses et belles dames d’Angleterre) bring him a gift of 100 jacobus for his subsistence for 15 days.9a) The next morning Mrs Dromont (Drummond? ), first lady-in-waiting, through a Scottish nobleman, Mr. Pringle, informed Lespine’s host that Her Majesty wanted to bear all the costs of his stay in London. The Queen supplied him with material for two suits, one in velour and one in satin with gold lace as well as very expensive cloth for a waistcoat. She also paid 50 jacobus for a party Lespine held for the suite of the Marshal de Lavardin, ambassador extraordinaire in London. Courante de la reine d'anglettere from the manuscript Finspong 1122 fol. fol. 4, Norrköping, Stadsbiblioteket. Courante de La Reine D'Angletaire from the manuscript Rés. F. 494 (Philidor Collection) p. 117, Paris, Bibliothèque Nationale..
Un tiers se trouvera d’un jugement divers. Moy, je t’asmireray pour ton Luth et tes vers. ... combien l’on entend de divers concerts d’instruments de musique durant le dîner, lequel, étant achevé, l’on commence le bal qui se fait en la manière que j’ai dit ci-devant, savoir au son des tambours et trompettes et toujours une danse allemande. Alors chaque Prince prend une Dame et chacun va selon son rang. Il est bien vrai que lorsqu’ils font quelques fêtes en leurs Cours en particulier, ils dansent au son des violons ou autres instruments, et même la plupart des danses que l’on a accoutumé de danser en France et autres lieux, mais en cérémonie, non, n’en étant pas la coutume. Lespine was in Vienna in the next year, 1619, since he states that he was in the city when Emperor Matthias died (on 10 March 1619). 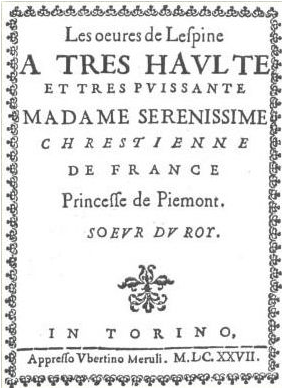 He also noted that His Majesty usually had a grand corps de musique and that the Emperor had no other pleasures than hunting and listening to music laquelle il oblige de jour en jour, par ses libéralites, à rendre son concert meilleur.18) Lespine seems also have been present in Frankfurt am Main on 8 August 1619 when Ferdinand II was elected King of the Romans and Emperor of Germany. On 26 August 1619 the Bohemian delegates protested against the election and a civil war broke out and affected Lespine at Neisse, most probably the city of Neisse in Silesia (today Nysa in Poland), c. 75 km south of Breslau (today Wroclaw, Poland). Archduke Charles fled to Warsaw and we may suppose that Lespine accompanied his employer to Poland. They must have arrived during the last quarter of 1619. Lespine was very well received among the gentry and was very impressed by the magnificence of the Polish court. According to his Brève description… Ce Prince [prince Wladyslaw or king Zygmunt/Sigismund III] se plaît sur tous les hommes du monde à la musique’.19) He also mentions that Archduke Charles proposed a toast to him in the presence of Sigismund Wasa III and he states with a lot of self-reliance: Il n’y a [un] Prince souverain qui ne fut désireux de m’avoir, mais mon humeur a toujours été libre et desireux de voir le monde.20) According to Lespine King Sigismund offered him a yearly salary of 1000 sequins if he stayed at his court. However, the musician declined the offer and stayed only a short time at his court. From Warsaw Lespine then travelled by boat on the Vistula to Danzig (Gdańsk), the main city in the Polish province called Royal Prussia, and noted that the town was filled with rich merchants. He left Danzig, possibly at the end of 1619 or the beginning of 1620, by boat to Sweden. His visit there seems to have been rather short, taking place some time between 1619 and 1620. Lespine states that he had not seen much of this country. The description of Sweden is succinct, superficial and impersonal. Nothing of musical interest is noted. What makes this journey more interesting is the fact that there are musical traces of him in Sweden, in the form of music in a few manuscripts. However, it is important to note that nothing proves that these manuscripts have anything to do with his visit there. In some cases it is more reasonable to believe that they have come to Sweden through other channels. The manuscript that one most likely could connect with Lespine’s visit to Sweden is En fransk balettmässtares och danslärares i Bruxelles, 1614–1619, anteckningsbok… (The notebook of a French ballet- and dancing-master from Brussels, 1614–1619…), which is kept at the Royal Library in Stockholm. On f. 74 of this book a M. Destourmelles is mentioned, le tres humble serviteur de tous les beaux esprits et braves cavaliers de l’honneur et amateur des Nobles et ceceis donneur. The dancing master’s book contains several pieces of music by Lespine, notated in French lute tablature. These pieces, rapidly and carelessly written, represent only a minor part of the manuscript and reflect the current taste in music during the first decades of the 17th century. Apart from Lespine’s music the source offers several texts to ballets and songs, dance-instructions, tunes in normal notation as well as some recipes, among other things against toothache and epilepsy and for making fireworks! This manuscript is an important document in the history of dance. It is the oldest preserved diary of a dancing- and ballet-master.21) It could of course be a coincidence that the dating of the collection lies close to the possible visit of Lespine in Sweden. In any case one can only trace its provenance back to the 19th century. From Sweden Lespine continued his travel to Denmark where he was offered a post by King Christian IV. Again he declined, according to himself, for religious reasons. However, Christian IV showed him great favours; Lespine points out that not for anything was the King the brother of Queen Anne of England. Christian IV held his court at Copenhagen and Lespine finds the garden there particularly attractive. The musician also mentions the town of Elsinore. It is strange that he doesn’t mention the rich musical life at the court of Christian IV at all although, for example, both John Dowland and Thomas Robinson had served as lutenists in Elsinore. Other foreign court lutenists were Thomas Cutting, John Stanley and Christian Brade.23a) Lespine’s account of his travels ends with Denmark and he states that he never visited Spain and in Italy only Turin. No later than 1621 he returned to France where he was again engaged by the house of Lorraine. Later on he moved to the Turin court. In this city he published his collected works, Les Oeures [sic] de Lespine… in 1627. His life thereafter is wrapped in mystery. Lespine as a musician soon fell into oblivion and one cannot count him among the most important authors or composers of his age. For several years the Centre National de la Recherche Scientifique has planned to publish his music in the series Corpus des luthistes français and when this appears we will then have a better foundation on which to judge his importance in the history of music. Strangely enough his music is not found in any French source as François Lesure and François-Pierre Goy have shown.23b) However, the number of sources in which he is represented leaves no doubt that he was of some importance in music during the first half of the 17th century. His connection to Sweden was probably of a very occassional character and it is possibly only a matter of chance that so much of his music has been preserved there. His works are scattered in many other sources, mostly English and German. He is well represented in the manuscript of Johannes Aegidius Berner of Rettenwert (Prague Ms. IV. G. 18) and in the Haslemere collection Ms. II. B. 1. 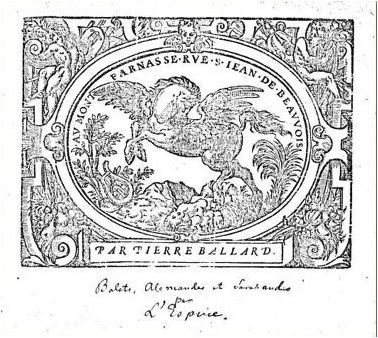 The printed source containing most works by Lespine is Louis De Moy’s Le petit Boucquet Orientale from 1631. Altogether about 54 individual pieces by Lespine have so far been identified. Some of these have many concordances, which is clear from John H. Robinson’s edition of 30 pieces in viel ton. S-S S 253, fol. 114v (Tuning A); Other versions: Cf. Vallet CLF I, n_ 71. GB-HAdolmetsch II B 1, fol. 276v–277 (Tuning A); CZ-Pnm Ms. IV. G. 18, fol. 155v–156, ‘Courante Lepin’; US-R Ms. M. 140. V. 186. S, p. 44–45, ‘Courante d’L Espine’. S-N 1122, fol. 19v–20 (Tuning D); S-N 9096:11, fol. 6'–7, "(S.T., S.N.)". Switzerland, Basel, _ffentliche Bibliothek der Universit_t Basel, Musiksammlung, Ms. F. IX. 53. Czech Republik, Prague, N_rodni Muzeum, Hudebn_ Oddeleni, Ms. IV. G. 18. 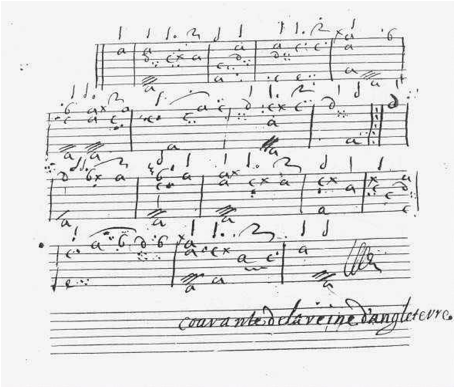 Lute tablature manuscript with both Italian and French lute tablature. Also called the Rettenwert MS after its former owner Johannes Aegidius Berner de Rettenwert. Dated 1623 and 1627. GB Cu Nn. 6. 36. Great Britain, Haslemere, The private library of Carl Dolmetsch, II. B. 1. Sweden, Norrk_ping, Stadsbiblioteket, Finspong 1122 fol. US-R MS M. 140. V. 186. S.
USA, Rochester, New York, Eastman School of Music, Sibley Music Library, MS M. 140. V. 186. S.
This manuscript is bound with a copy of Nicolas Vallet’s Paradisus musicus testudinis…(1618), Le Second livre de Tablature de luth… (1619), XXI Pseaumes de David… (1619). 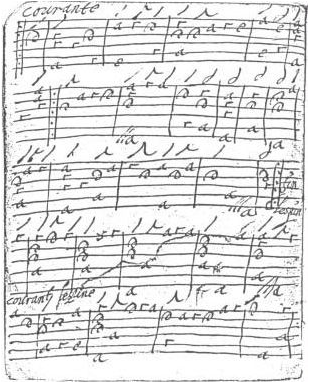 The manuscript probably dates from c. 1630–1635 and it shares repertoire and tunings with various English and continental sources from this time. I’m particularly grateful to François-Pierre Goy for supplying me with information on most of the sources as well as for his valuable suggestions, corrections and additions. I’m also grateful to Tim Crawford who gave me information about the manuscript in New York. I wish to express my thanks to Peter Király who has added most valuable remarks, suggestions of changes and corrections as a discriminating and careful editor of Die Laute. I also would like to thank Jean-Marie Poirier who made me aware of a concordance with the Philidor Collection in Bibliothèque Nationale. Magdalena Tomsinska has provided corrections to my text. Finally I would like to thank John H. Robinson for his thorough work with the edition of Charles de Lespine’s 30 pieces in viel ton. 1) Frédéric Lachèvre, Un joueur de luth et compositeur des cours princi_res auteur dramatique et po_te Charles de Lespine parisien…, Paris 1935, p. 17. 3) Lachévre, op. cit. reprints the Br_ve description… on p. 51–121. 4) Lachèvre, op. cit. p. 166 ff. 5) Thomas Campion wrote a masque for the marriage between Hay and Honora Denny, printed the same year by John Windey. The Masque of Lord Hay's Marriage Thomas Campion 1607. Menston 1973. I'm grateful to Tim Crawford who pointed at the possibility that Milord de Haix could be identical with James Hay. 6) The latter is probably the trading town of Vlissingen in southwestern Netherlands, situated on the southern coast of the Walcheren Island, at the mouth of the western Schelde (Scheldt) estuary. 7) Queen Anne is identical with the Princess Anne to which John Dowland dedicated his Lachrimae in 1604. 8) S-N 1122. fol. fol. 4. 9a) Lachèvre, op. cit. p. 71. 9b) I'm most grateful to Jean-Marie Poirier who made me aware of this concordance. 10) Lachévre, op. cit. p. 84.11) Lachèvre, op. cit. p. 25. 12) Lachévre, op. cit. p. 15. 14) Lachévre, op. cit. p. 109. 15) However, as Peter Király has pointed out in personal communications to me, one can have serious doubts whether Lespine really could have travelled all the way from Vienna to Constantinople and back to Vienna within three months. The roads in Hungary and on the Balkan were very bad, particularly about the end of the winter and the springtime. 16) Lachèvre, op. cit. p. 96. 17) Lachèvre, op. cit. p. 103. 18) Lachèvre, op. cit. p. 105. 19) Lachèvre, op. cit. p. 115. In an e-mail 2013-04-06 Magdalena Tomsinska remarked that the prince mentioned probably was the 24-year old prince Wladyslaw. 20) Lachèvre, op. cit. p. 92–93. 21) Peter Brinson. Background to European Ballet. Leyden 1966, p. 117 ff. 22a) Louis de Geer the elder (1587–1652) is called the father of Swedish industry and the most important industrialist in Sweden during the 17th century. He was born in the Netherlands but important in forming a Swedish iron industry. His son, Louis de Geer younger, born in Amsterdam, is titled patriot in a Swedish biographical dictionary. He came in Swedish service as a colonel in 1645 and later took part in the war between Sweden and Denmark 1675–1679 (the so-called Scanian war). 22b) François-Pierre Goy. 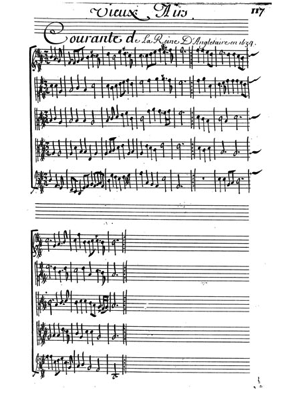 Les sources manuscrites de la musique pour luth sur les "accord nouveaux" (vers 1624 - vers 1710). Catalogue commenté. Université de Paris-Sorbonne (Paris-IV). U. F. R. de musique et musicologie. 1988-1989 pp. 166ff. 24) I'm very grateful to Franççois-Pierre Goy, who supplied me with the foundation for this list. On the sources in general see Wolfgang Boetticher, Handschriftlich _berlieferte Lauten- und Gitarrentabulaturen des 15. bis 18. Jahrhunderts. RISM B VII. München 1978; Sources manuscrites en tablature: luth et theorbe (c. 1500–1800). Catalogue descriptif, Vol. I: Confoederatio Helvetica (CH), France (F). Baden-Baden & Bouxwiller 1991, Vol. II: Bundesrepublik Deutschland (D). Baden-Baden & Bouxwiller 1994, Vol. III/1: Österreich (A). Baden-Baden & Bouxwiller 1997, Vol. III/2: Republique Tcheque (CZ), Hongrie (H), Lituanie (LT), Pologne (PL), Federation de Russie (RF), Slovaquie (SK), Ukraine (UKR), Baden-Baden & Bouxwiller 1999. 25) Arrangement followed by a variation by the violin player Johann Schop from Hamburg. 26) This version is published in Ballard CLF II, p. 78. 29) The music is not notated. 30) Rudolf Flotzinger, Die Lautentabulaturen des Stiftes Kremsmünster, Thematischer Katalog, Wien 1965, p. 25 ff. 31) Livre de luth d'Albrecht Werl …, Genève 1990. 32) Matthew Spring, The Lady Margaret Wemyss Manuscript, The Lute 27(1987) p. 5–29. 33) Diana Poulton, The Dolmetsch Library, Haslemere, MS. II. B. 1, The Consort 35(1979) p. 327–341. This manuscript seems to be the same as the one formerly in the private collection of professor Max Kalbeck in Vienna. Wolfgang Boetticher, op. cit., p. 360. 34) Jane Pickeringe's Lute Book c. 1616 – c. 1650 (London, British Library, MS Egerton 2046), Clarabricken 1985. 35) The Board Lute Book, Leeds 1976. 36) The St. Petersburg 'Swan' Manuscript, A Facsimile of Manuscript O No 124 Library of the St. Petersburg Academy of Sciences, Columbus 1994. 37) Jan-Olof Rudén, Music in tablature, A thematic index with source descriptions of music in tablature notation in Sweden, Stockholm 1981, p. 36 f.
38) Rudén, op. cit. p. 37 f.
39) Rudén, op. cit. p. 43. Peter Brinson, Background to European Ballet, Leyden 1966, p. 117. 41) Adrienne Simpson, Richard Mathew and ‘The Lute’s Apology’, Lute Society Journal 8(1966) p. 41–48. ; François-Pierre Goy, Richard Mathew's Prefatory Epistle and the Contents of The Lutes Apology, The Lute, 31(1991), p. 2–7. 42) Louys De Moy, Le petit boucquet Pour toucher du luth join deux violes de gambas par-my les vois, Peer 1987. 43) Nicolaes Vallet, Ouevres de Nicolas Vallet pour luth seul. Paris 1970.; Nicolaes Vallet, The Complete Works of Nicolaes Vallet. 3. Secretum Musarum I. Utrecht 1992. 44) Nicolaes Vallet, Ouevres de Nicolas Vallet pour luth seul. Nicolaes Vallet, The Complete Works of Nicolaes Vallet.